Hi, Everyone! 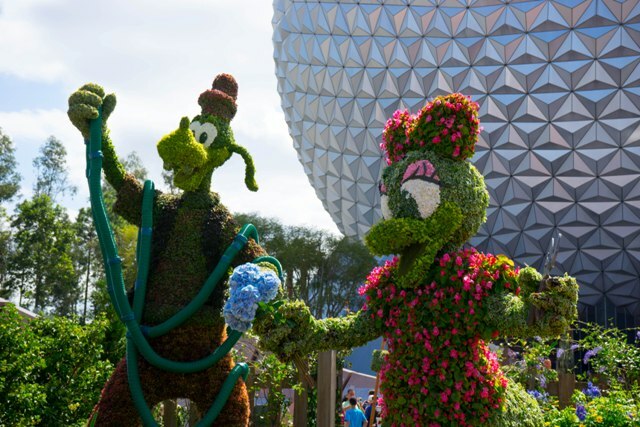 Welcome to the Best Week Ever here at Walt Disney World. Get ready because this week we’re visiting Disney’s Hollywood Studios, Downtown Disney, Magic Kingdom and taking another look at the Flower and Garden Festival at Epcot. Wow, it was a busy week! Let’s get going! Of course, since I was there I had to check out what else was new for you. Click to read more to see what other trouble we got into this week. 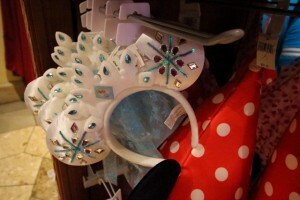 I also spotted some new mouse ears while I was in the park. The Elsa Minnie Mouse headband are barcode 400009 062755 and cost $21.95. These were so pretty and even have a little Elsa cape hanging off the back. I’m sure these are going to sell out quick! 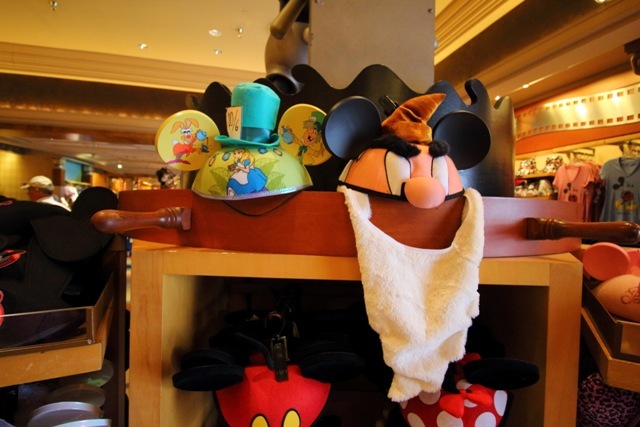 On the right are another couple of new mouse ears that have shown up! The Alice in Wonderland ears are barcode 400008 932639 and Grumpy is 400008 910873. Both of these retail for $17.95. I’ve heard there is also a Tigger pair that I’ll be hunting. I stopped by the The Twilight Zone Tower of Terror gift shop to see all the new merchandise. I suppose I’m not a good judge, because I didn’t know what was new and what was old! If you’re braver than I am then please let me know what looks new in the photo below! 🙂 I also spotted a new Tomorrowland billboard up in the park. I’ve decided I’m not watching any previews for this movie and I’m just going to watch it in theaters when it’s released. I’m really excited to see it. What do you think? Over at Downtown Disney, DisneyQuest is still standing. I only mention it because you never hear about that place anymore! We went on a Tuesday night and there was nobody there. It was actually a little creepy to wander around alone. 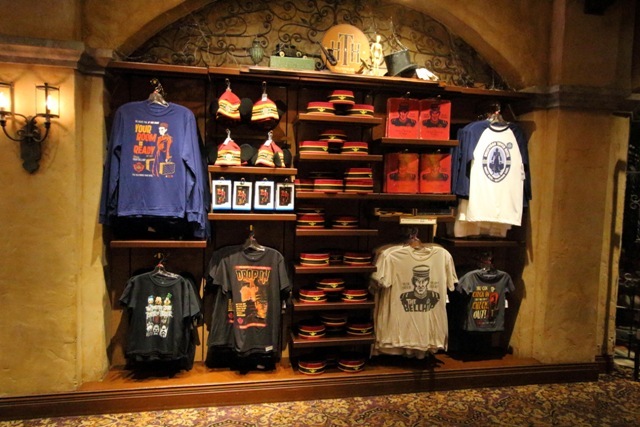 While DisneyQuest is slowly disintegrating, new shops are popping up all over Disney Springs. The latest is Havaianas, a flip flop shop. Disney Springs is slowly starting to come together! The bridge opened that basically connects T-Rex Cafe to Rainforest Cafe. There are four little sales kiosks across this walkway and the one we were most excited about has gourmet cookies. Well, that is we were excited until we got there. If you click on the photo below right you’ll see a bunch of little specks all over. Those, my friends, are bugs! They were all over this booth and the staff was making no attempt to get rid of them. I know the food is sealed in plastic… but still… ew! We skipped trying them. What would you have done? Later that night we had scored a FastPass+ for Wishes and I was excited to tell you all about the new viewing location. 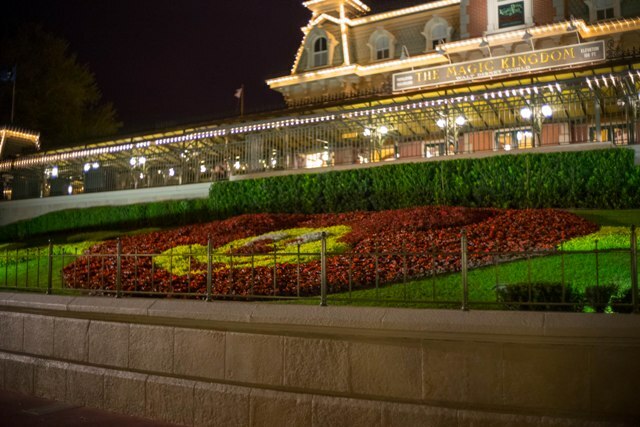 On the way in I noticed that the Mickey planter now has an iron fence up. It seems one too many guests sat on this wall! 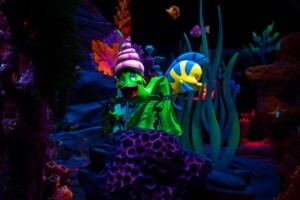 The other Fastpass+ we were able to get was for Under the Sea ~ Journey of the Little Mermaid. The Touring Plans Youtube channel has a full ride through courtesy of Seth Kubersky but I wanted to share a couple photos from my ride. Spoiler: I absolutely loved it! On a personal note, my FastPass+ is finally working correctly. After 9 months of trouble, they finally figured out that when I upgraded my ticket they never deactivated the old one. So the system was randomly assigning between the two tickets. I only mention it in hopes that is might help on of you. The system really is great when it works! One quick side trip this week, we also visited the Chinese Lantern Festival taking place at the Lowry Park Zoo in Tampa. I know that is quite a ways from Disney but if you’ll have a car and a free day when you’re visiting I highly recommend this event taking place until May 31st. We’ll be back for sure! I could never do it justice with just a couple of photos, but I wanted to make sure I shared in case anyone can make time for it. Tickets are $25 per person. 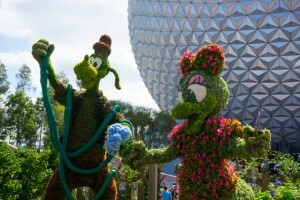 Our last stop this week is Epcot for the rest of the Flower and Garden Festival that didn’t quite make it in last week. 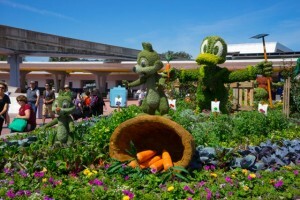 The planter at the park entrance wasn’t completed last time so I had to include it here. 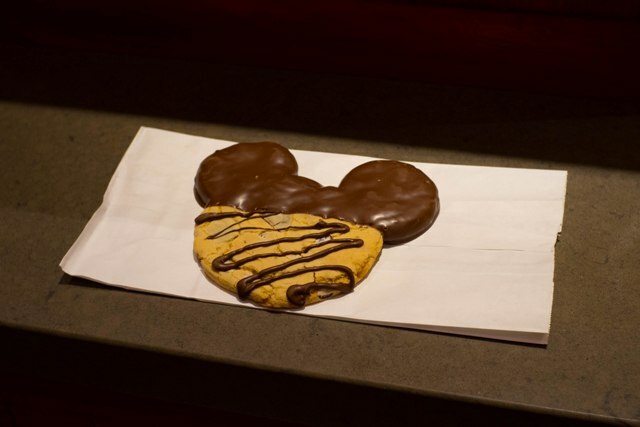 I’m so happy to see Chip and Dale included! Has everyone heard the controversy about Goofy? Well, at certain angles it looked like he wasn’t exactly watering the flowers with that hose. 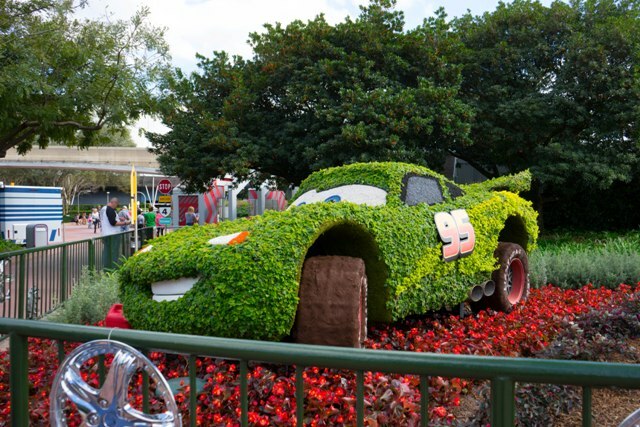 They put bushes up but it didn’t really help. When I was there on Sunday they had just shut the water off completely. I wonder who didn’t see that coming?? 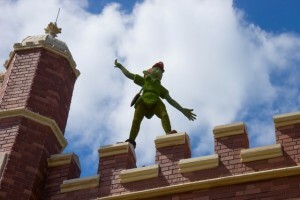 While I missed Peter Pan last week, I think it was kismet. 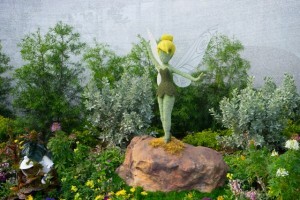 I was really just waiting until Tink was on display to be shared with him. They are both back in their regular spots this year with Peter on a gift shop roof in the UK and Tinkerbell outside the butterfly garden. The festival has now officially begun with Tow Mater and Lightning McQueen on display. They are again on the walkway between Test Track and the International Gateway. It’s hard to tell from the photos, but they really are nearly the size of actual cars. 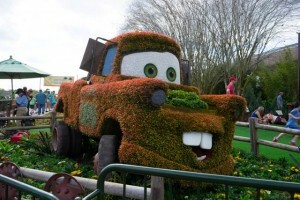 There is a hubcap on the fence in front of Lightening for a size reference. 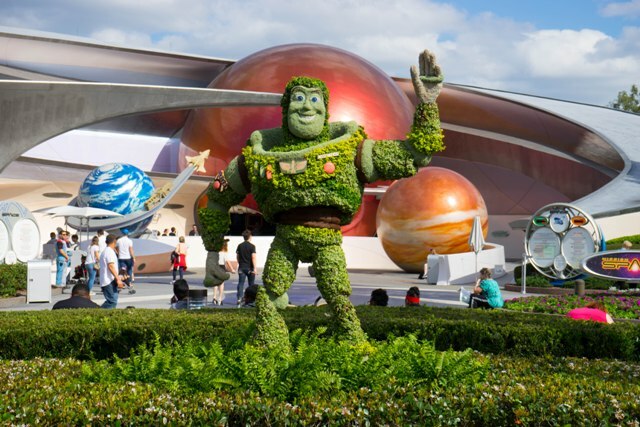 Buzz is back in front of Mission Space. I’m always sad that Buzz and Woody are very far away from each other but they both look so good in their current locations. So far it looks like Lotso is on the chopping block this year unless he’s hiding somewhere and I haven’t managed to find him. 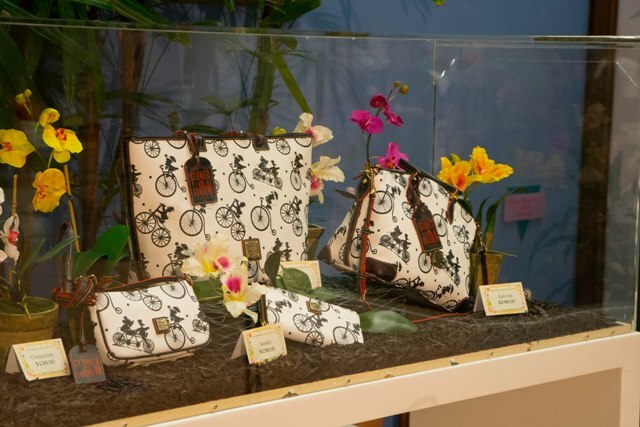 Over in the festival center I found a new Duffy for sale ($30) and the new Festival Dooney & Bourke pattern bags. It was lucky I happened upon this because the Festival Center is only open from 10am – 5pm on Friday, Saturday, and Sunday this year. It seems like they’ve cut back quite a bit on presentations in there. At 4:45pm we were actually approached by a cast member and told we would have to leave so they mean business. Make sure you plan you’re visit carefully if you want to stop in the Festival Center. 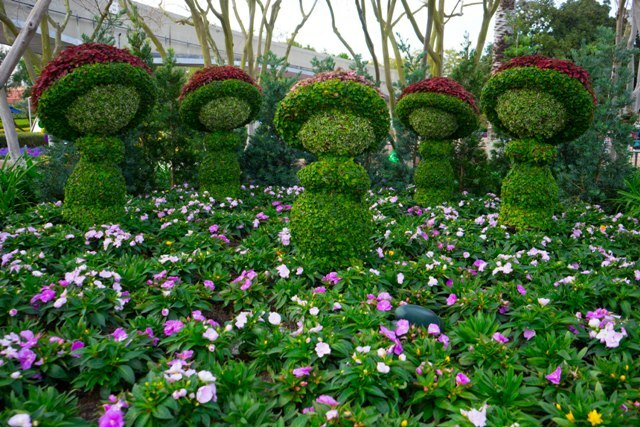 As we were leaving the Festival Center, I finally found where the Fantasia topiaries are hiding this year! 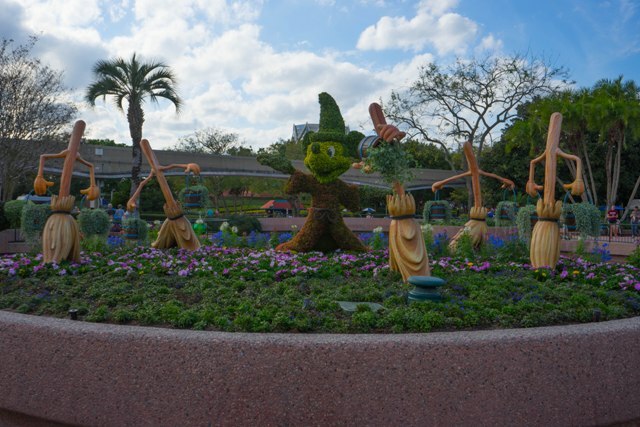 Mickey is there in all his glory with brooms, dancing hippos, and dancing alligators. 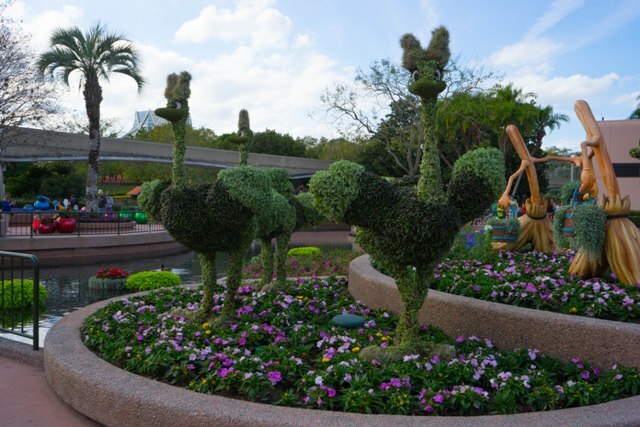 On the other side are everyone’s favorite ostriches and dancing muchrooms! 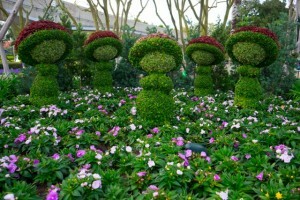 I now this group of topiaries has been around a really long time but it never gets old. I’m so happy to see this classic movie get featured the way it deserves. 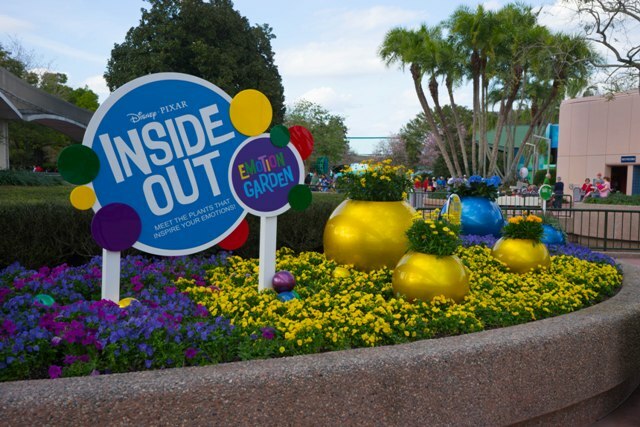 One last little spot that I checked out this week is the Emotion Garden from the upcoming Pixer film, Inside Out. While this wasn’t anything too special I’m glad to see they’re doing anything new. The full display isn’t pictured below, but you get the idea. It pretty much just featured brightly colored planters and plants for each of the emotions from the film. It’s a pretty addition. Crowd Calendar: Spring break is in full swing. 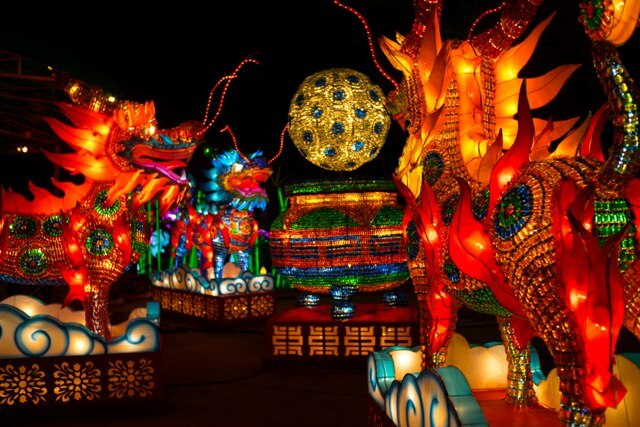 Be sure to plan for crowds and optimize those Touring Plans! Weather: Highs are already creeping up into the mid 80s with lows in the mid 60s. Be ready for rain! 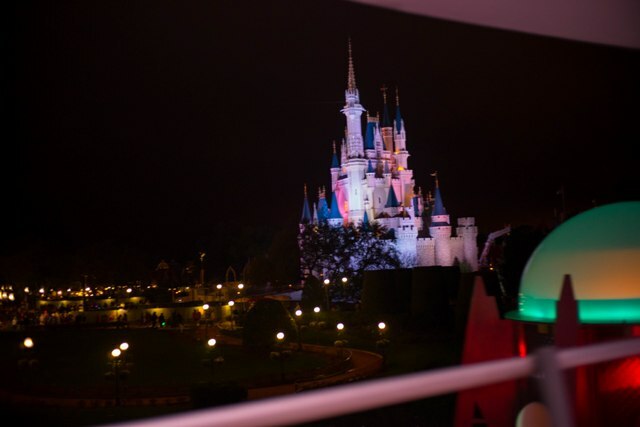 Remember: While the new Hub Gardens have become a popular place to just sit and relax, they also provide a decent view of the castle stage show. 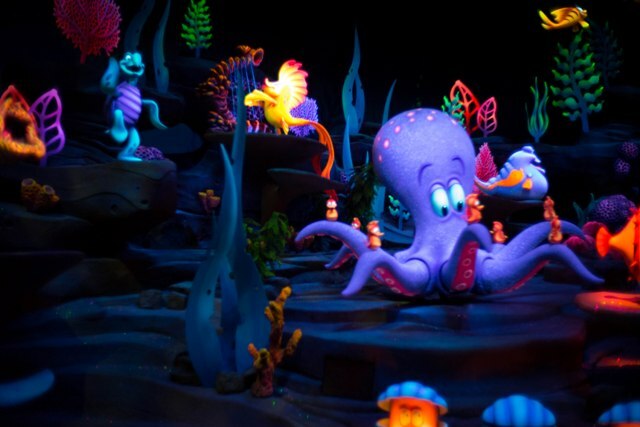 Don’t forget, this show will be under refurbishment 4/13 – 5/20. 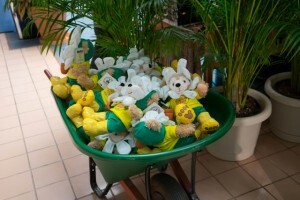 You can find a full list of refurbishments here. Here’s my top tip for this week: Don’t make the mistake that I did, prepare for wild weather! Be ready for rain, hot, and cold. You never know what you’re going to get this time of year. Hi Daisy, Thanks for another fab post. I just have a couple of questions. 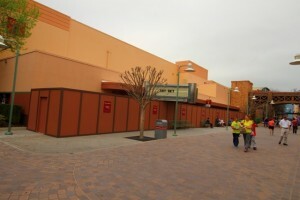 I see there are notices on the walls that are currently in front of the Chinese Theater, do they indicate when they are likely to be removed so there is a totally unobstructed view? 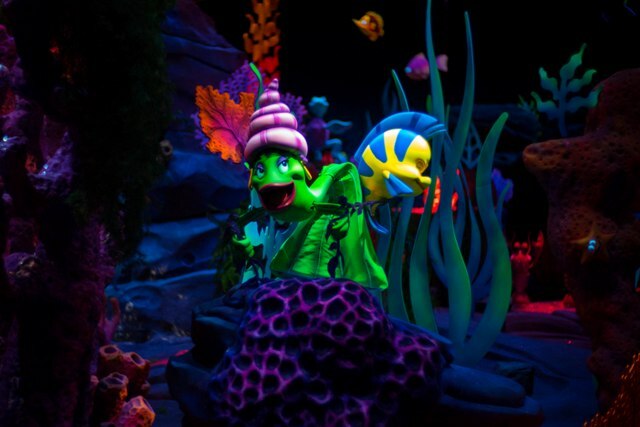 I also am a huge Alice in Wonderland fan so I adore those new ears, but do they feature my absolutely favourite Disney character, the Cheshire Cat? I am hoping that he might appear on the back. Have you seen them anywhere other than DHS? Thanks in advance. Only 16 days to my next WDW holiday so I can have the best fortnight ever! Hi Sarah! 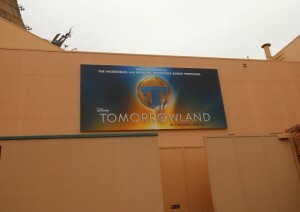 The messages on the walls are mostly just advertisements for the other attractions on the Studios. 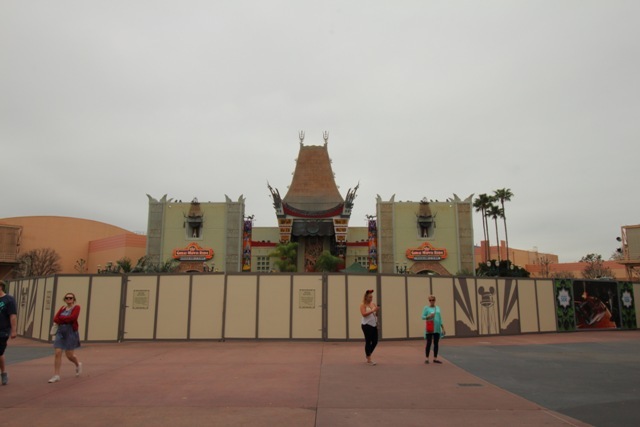 I’ve heard rumors that the walls won’t come down until late April, though. 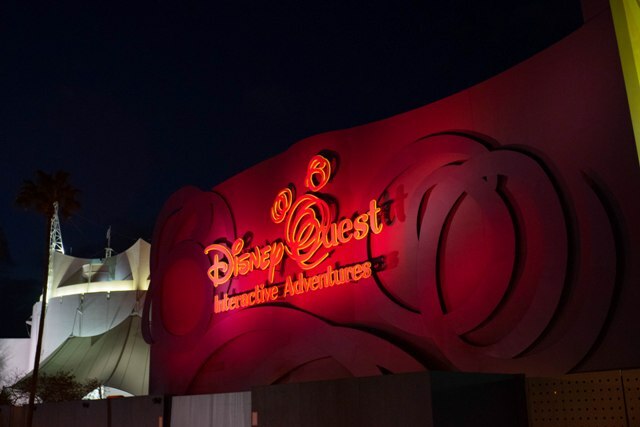 I haven’t seen those ears anywhere other than DHS… but I haven’t looked. I’m sure they are around. I think the Cheshire Cat was on the back but now I’m questioning myself. I’ll look and reply again. 🙂 2 MORE WEEKS!!!! I have my own countdown going so I know how excited you must me! Hi Sarah- I checked this weekend and the Cheshire Cat’s face is on the back with a string of lanterns. Only a few days until you can get a pair of these beauties!! Great post Lauren, could you talk about Character meet and greet Etiquette. Meeting your favorite character is so special and knowing what to do and not to do would be great. Also what is the appropriate time to spend with a character ie., a couple of photos or a couple of minutes. This may help people prepare and plan better or not be the person everyone is glaring at in the line. Keep up the good work! Hi Terrae! In my experience the characters are very happy to spend time with you. They want to make sure you get the memory you deserve. I’m normally just there for stock photos so I’m very quick. But as an example I spent several minutes with BayMax the first time I met him. My best tip is to tell the character exactly what you want and for costume characters be sure to speak loudly and clearly as it can be tough to hear. Personally, I think it is difficult for the character to lead the interaction since they can’t talk. On the other hand, face characters (like a princess) I always let them lead the interaction as I feel like it’s easier for them. That would be great, we will be there in May. 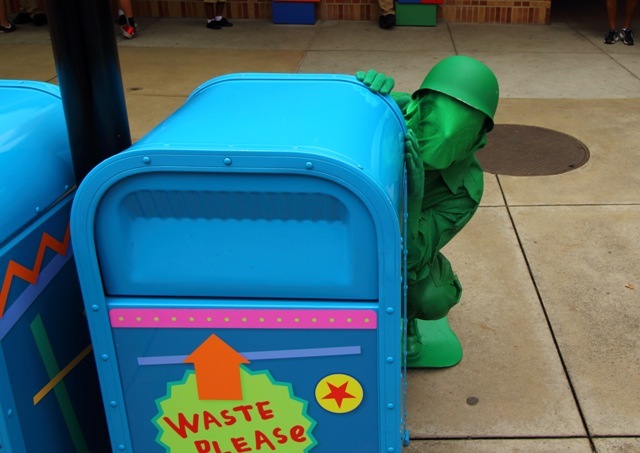 Is there any info on character meet and greets for children with special needs. My little one has a speech delay and telling the handler or character can be a little awkward if you know what I mean. We still enjoy the pictures though. look forward to your post next week, Thanks! Cookies from a buggy bin? Not a chance in this world! Hahaa, Marmorgan!! My hubby called me a diva but I knew I wasn’t the only one. 😀 Thanks for your kind words and commenting! So, so, soooooo gross!! It makes my skin crawl just looking at that pic. I would not eat those either! Haha! Thanks, Jane. Good to know I’m not alone! Great report, but LOL at bitterly cold: 54 degrees. Here in Chicago it will be 54 degrees and people are celebrating. This is shorts weather here! Yep. My kids wore shorts and t shirts to school. Chicago. So happy for some warm weather! I love following you around the world each week! I can’t wait to hear about the fastpass+ viewing area at MK – thanks for checking it out! Vanessa!!! Hey girl! 🙂 I can’t wait to get into the FP+ viewing. Soon!! Love this series! I’m sad, though, to see the railing by the Mickey planter. We always took a picture there as kids and now do the same with our own kids. I guess we’ll just stand from now on. 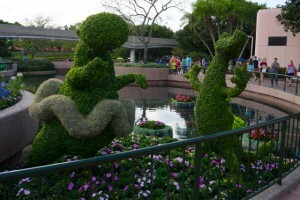 I love the pic of Chip and Dale in topiary form…they’re my favorite! 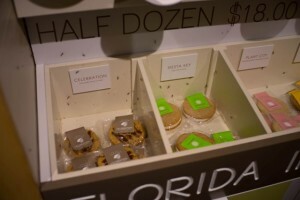 Buggy cookie bins? No way! 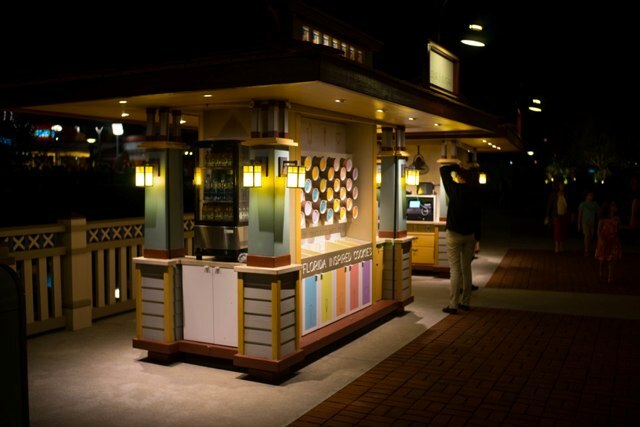 I’m afraid of bugs so I would have been running away from that kiosk as full speed, lol. Plus, just no. That’s kind of gross even though they are wrapped. Hi Dawn! I thought of you when I was taking the Chip and Dale photo. I told my friends I had to stop and get that photo specifically! 🙂 Glad you were here to see it! Great post as usual. Your comment about 54 degrees being cold reminds me of one time when I was in college (in Boone, NC, at 3333 ft elevation). The temp had just broken 50 in the early spring, and everyone in my linear algebra class was commenting on how warm it was…. except one girl from Florida, who raised her hand and said “you people are CRAZY, I’m FREEZING!!! !” LOLOL. Seriously, even here in the South (but in the Mountains), 54 is a heat wave after days below zero. I look forward to your next post. 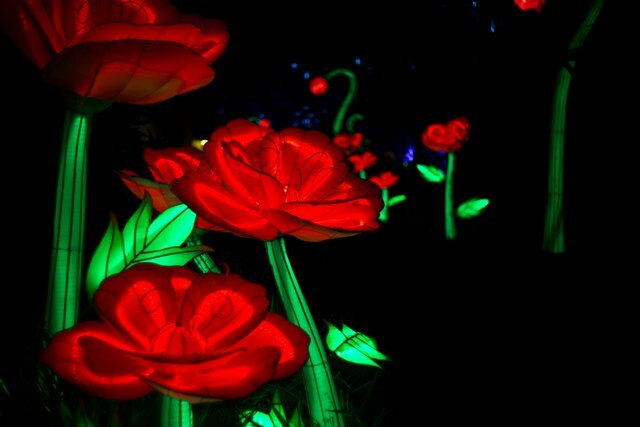 We will be back in the World on May 9, and we can’t wait!!! Hi Lee – you guys are cracking me up! I’d freeze! 🙂 You’re stronger than us wimpy Floridians!